Manali is located at 32.2396 N, 77.1887 E, about 40 km (25 mi) north of Kullu town. The town ranges in elevation from 1,800 m (5,900 ft) to 2,000 m (6,600 ft) in the uppermost Old Manali section. 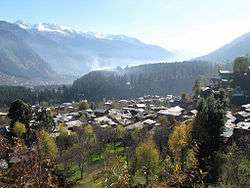 Manali has grown from a trading outpost/ village to a small town; as of the 2011 census of India, its population was 8,096. In 2001, Manali had an official population of 6,265. Males constituted 64% of the population and females 36%. Manali had an average literacy rate of 74%, higher than the national average of 59.5%; male literacy was 80%, and female literacy was 63.9%. 9.5% of the population was under six years of age. During the summer months there is a marked surge in the transients as many of them are employed in the hospitality businesses. The climate in Manali is predominantly cold during winter and moderately cool during summer. The temperatures range from 4 °C (39 °F) to 26 °C (79 °F) over the year. The average temperature during summer is between 10 °C (50 °F) and 26 °C (79 °F), and between −15 °C (5 °F) and 12 °C (54 °F) in the winter. Monthly precipitation varies between 31 mm (1.2 in) in November to 217 mm (8.5 in) in July. In average, some 45 mm (1.8 in) of precipitation is received during winter and spring months, increasing to some 115 mm (4.5 in) in summer as the monsoon approaches. The average total annual precipitation is 1,363 mm (53.7 in). Manali experiences snowfall predominantly between December and beginning of March. The month of January is when it is usually the highest. 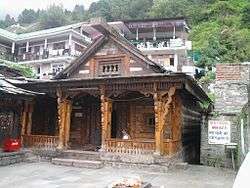 Vashisht Temple, in Vashisht, Manali. 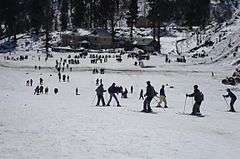 Manali is among top Indian skiing destinations. The British introduced apple trees in the area. The first apple orchard was set up by the British near Patlikuhl, prior to this no Apple trees grew in the area. To this day, apple—along with plum and pear—remain the best source of income for the majority of inhabitants. Both Rainbow and Brown Trout was also introduced into the rivers and streams of the area by the colonisers. Before other luminaries started visiting Manali, the Indian nation's first Prime Minister Pt. Jawaharlal Nehru favoured this as a holiday destination in the mountains. With the increase in disposable incomes and somewhat owing to the rise of disturbances in Kashmir in the late 1980s, Manali witnessed a surge in tourist traffic. This once quiet village was transformed into a bustling town with numerous homestays as well as the occasional luxury boutique hotel and spa. During the warmer summer months, cafes and restaurants can be seen doing brisk business. 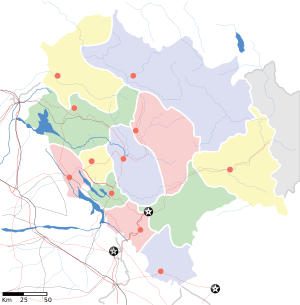 The nearest airport Bhuntar Airport (IATA code KUU) is at Bhuntar town, situated on NH21 about 50 km (31 mi) south of Manali and 10 km (6.2 mi) south of Kullu town. The airport is also known as Kullu-Manali airport and has more than a kilometre long runway. Air India has regular flights to the airport from New Delhi. Recently another operator 'Himalayan Bulls' has started flights on Kullu-Chandigarh-Kullu sector thrice a day http://himalayanbulls.com/ International connecting flights naturally are from Delhi's IGI Airport. Manali can be reached from Delhi by national highway NH 1 up to Ambala and from there NH 22 to Chandigarh and from there by national highway NH21 that passes through Bilaspur, Sundernagar, Mandi and Kullu towns. The road distance from Chandigarh to Manali is 310 km (190 mi), and the total distance from Delhi to Manali is 570 km (350 mi). Luxury buses (including Volvos) usually ply overnight on this route and are available from all major bus terminals. Besides 12 Non-AC services, HRTC (Himachal Road Transport Corporation) runs five daily Volvo and AC buses on Delhi-Manali route and two separate Volvos by HPTDC (Himachal Tourism Development Corporation). There is no close railhead available close to Manali. The nearest broad gauge railheads are at Una 250 km (155 mi) away, Kiratpur Sahib 268 km (167 mi), Kalka (275 km (171 mi)), Chandigarh (310 km (193 mi)), and Pathankot (325 km (202 mi)) . The nearest narrow gauge railhead is at Joginder Nagar (175 kilometres (109 mi)). The Kalka–Shimla_Railway is nostalgic narrow gauge route culminating at the state capital of Shimla wherefrom one has to travel by road to Manali. See Bilaspur-Mandi-Leh Railway for the proposed railway line through this area. As of 2016 no activity is happening on this front. Manali has witnessed a flurry of activity related to hydroelectric power and tourism. Unplanned and rampant construction has led to severe depletion of forests and pollution of river bodies, along with garbage being disposed on the side of the mountains. There has been a loss of habitat to various species of fauna, not limited to the Himalayan Monal, incidentally the state bird of Himachal Pradesh. This prompted the National Green Tribunal to intervene and limit vehicular movement on the popular Manali - Rohtang Pass highway, as well as Solang Valley. This has somewhat arrested the damage, however a lot still needs to be done. varma, V. 1996. Gadd of Dhauladhar: A Transhumant Tribe of the Himalayas. Indus Publishing Co., New Delhi. Handa, O. C. 1987. Buddhist Monasteries in Himachel Pradesh. -03-5. 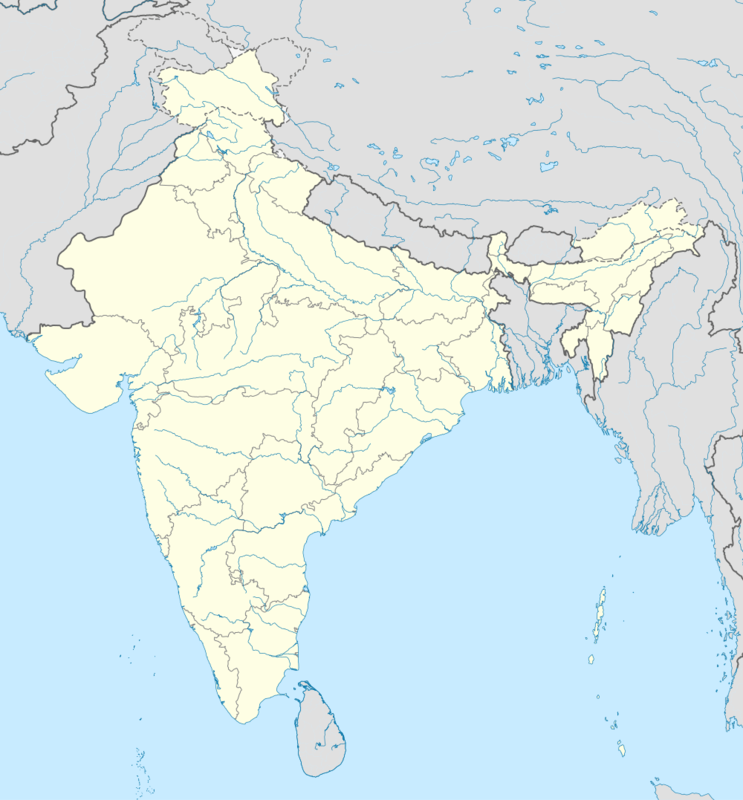 1 2 3 "Manali (Kullu, Himachal Pradesh, India) - population statistics, map, and location". Retrieved 2014-08-01. ↑ "Manali Climatological Table Period: 1971–2000". India Meteorological Department. Retrieved April 15, 2015. ↑ "Ever recorded Maximum and minimum temperatures up to 2010" (PDF). India Meteorological Department. Retrieved April 15, 2015. ↑ Rhymer Rigby (2 Feb 2008). "High in a Himalayan hippy haven". The Telegraph. Retrieved 2013-08-30. Wikimedia Commons has media related to Manali. Wikivoyage has a travel guide for Manali.